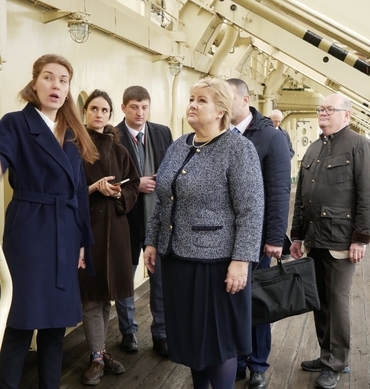 Prime Minister Solberg spent just over an hour aboard Krasin where she was given a guided tour of the icebreaker before she received three short introductions from the Nansen Center in St. Petersburg. Director Leonid Bobylev and Dr. Pavel Golubkin at NIERSC presented research on polar low pressures relevant to Norway. Research coordinator Lasse Pettersson from the Nansen Center in Bergen gave also an introduction on Russian-Norwegian cooperation and internationalization at the Nansen Centers. 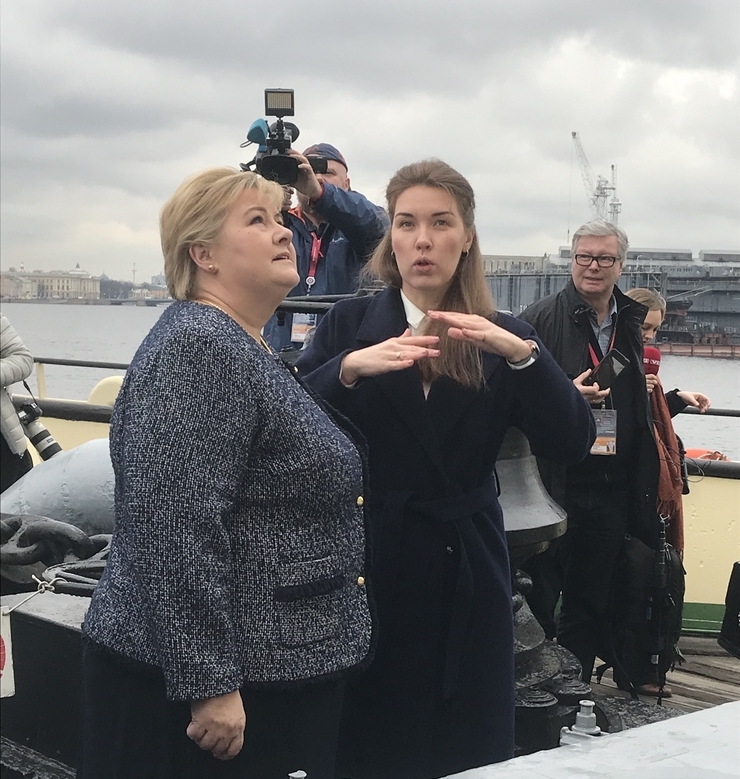 Through the introductions the Prime Minister learned, among other things, that the Nansen International Environmental and Remote Sensing Center (NIERSC) was established 19th October 1992 in St. Petersburg. 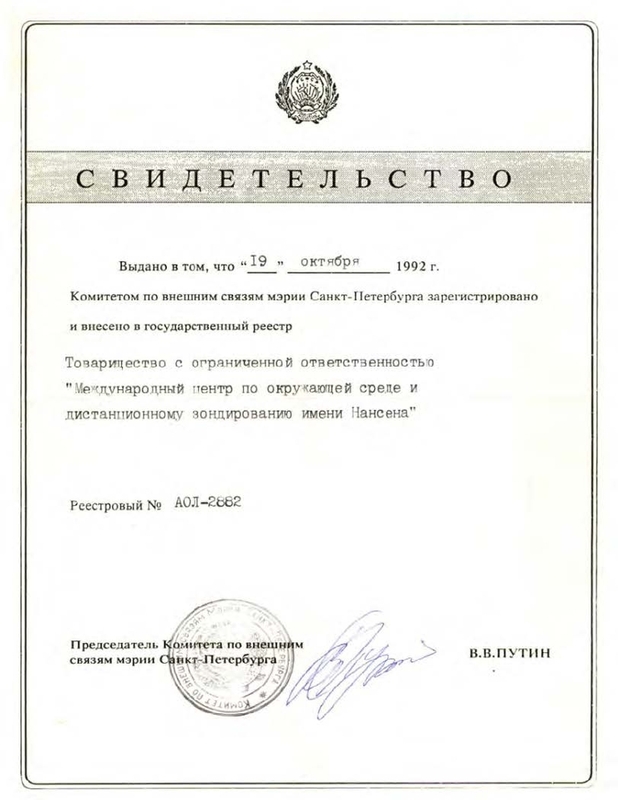 The certificate issued from the Committee on Foreign Relations of St. Petersburg City Administration was signed by V.V. Putin, head of the committee. During its 27 year existence the center has contributed with more than 250 scientific publications and 16 books in cooperation between Russian and international scientists and students. Several breakthrough publications have been published in high ranked international scientific journals, including e.g. Science and Tellus. The 17th book on “Sea ice in the Arctic: Past, present and future” has just been submitted for publication. Frequent reciprocal exchange visits of scientists and students have been a necessity for the cooperation and the development of new projects and research results as well as scientific publications and services. In 2005, the Nansen Centers in Bergen and St. Petersburg and the Max Planck Institute for Meteorology in Hamburg, were awarded the EU´s DESCARTE laureates for the project ”Climate and Environmental Change in the Arctic-CECA” for the research cooperation between Russia and Europe. The price released a similar funding from the Norwegian Ministry of Education and Science, which was used to support recruitment and research among young Russian scientists at the Center. Through the “Nansen Fellowship program” established in 1994 the Center contributes to recruitment of young scientists, in cooperation with the Nansen Scientific Society. So far, 29 doctoral candidates have obtained their doctoral degree at Russian educational institutions – primarily the St. Petersburg State University. Half of these are still working in the field of science in Russia. 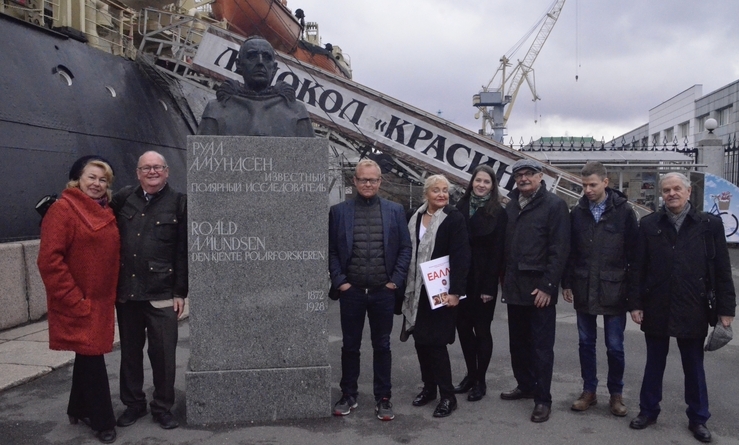 Nansen International Environmental and Remote Sensing Center (NIERSC) in St. Petersburg tries to follow in the footsteps of Fridtjof Nansen, through research of ocean science and exploration of the Arctic. The years after the collapse of the Soviet Union, natural science and polar research had a great stronghold in Russia, but lacking infrastructure and funding to maintain its excellence. A significant share of the scientific results and studies had been published in Russian language only although international scientific cooperation was, and still is, essential. Many Russian scientists were offered jobs abroad, but the Nansen Center decided to support and commit to long term cooperation with Russian based science research and education. 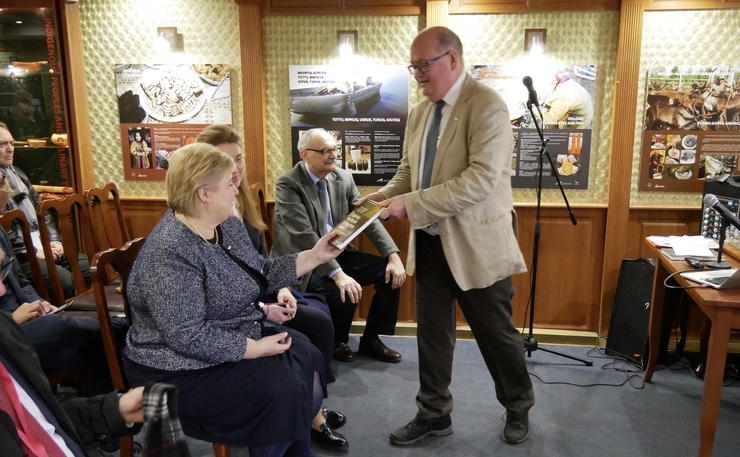 In conclusion of the successful visit, the Prime Minister Solberg was given the book along with a copy of the center´s certification from 1992 signed by Vladimir Putin.